Data Sources Dubin, p. 12; Philip J. Lampi; New Hampshire Gazette 12/4/1804; Boston Aurora 12/1/1804; Scioto Gazette 11/19/1804. Jefferson's vote in OH includes 76 votes for an elector pledged to Jefferson and Robert Livingston NY. President Thomas Jefferson was re-nominated by the DR Caucus with George Clinton running for Vice President. The Federalist Caucus nominated Charles C. Pinckney for President and Rufus King for Vice President. For a recap of the first term of Pres. Jefferson, see the DR Caucus page. VP Aaron Burr, realizing that his national career was at a standstill, launched a bid for the governorship of New York. George Clinton, the incumbent, was not running again in order to devote his attention to becoming the next Vice President. The state Federalists were divided about his candidacy; Alexander Hamilton was one of the leaders of the candidacy of Morgan Lewis while other Federalists supported Burr. When the results of the race for NY Governor were tallied, Lewis won a 58-42% victory. Burr was incensed by Hamilton’s campaign for Lewis, and their correspondence led to a duel on 7/12/1804 in which Burr killed Hamilton. In the congressional elections in New York, held at the same time as the race for Governor, the Federalists were held to only two seats, a foretaste of reductions in their representation in the upcoming Ninth Congress. In another Burr-related event, the requisite thirteen states ratified the Twelfth Amendment on 9/25/1804, guaranteeing that it would govern the conduct of the election of 1804. The initial Federalist strategy was to cast some of their electoral votes for Clinton, who they perceived more favorably than Jefferson, which would elect him President and Jefferson Vice President. This strategy failed when the Twelfth Amendment was ratified. At that point, Federalists gave up hope of influencing the election of 1804. 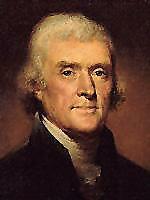 Jefferson was assured of 111 electoral votes, and Pinckney was assured of 12, as the fall campaign began. A majority being 89, Jefferson was already assured of victory. The four battleground states, all holding popular elections, were MD, MA, NH, and NC. In MD and NC, the Federalists contested some races in which Electors were chosen by districts. The fact that Jefferson ran a major effort in NH and MA indicates how weak the Federalists were in 1804. In addition to the two major tickets, John Bigger was an Independent Republican candidate for Elector in Ohio, pledged to Jefferson and Robert R. Livingston. Ten states chose Presidential Electors by popular vote in early 11/1804. Three chose by district: KY, MD, and NC. Seven chose by the General Ticket (at large): MA, NH, NJ, OH, PA, RI, and VA. In six states, the Federalists mounted a minimal effort. Jefferson won a dramatic victory in the four battleground states. He swept MA and NH by narrow margins, an indication of his support even in Federalist strongholds. Jefferson also carried MD and NC, although Pinckney won two districts in each state. In North Carolina, however, the two Federalist Electors were not certified. In the Tenth District, the county militia was called out in Bertie County on election day; the Pinckney Elector won the county by an interesting vote of 510-8. The county sheriff did not appear at the canvass to report this vote, which gave the district to Jefferson. A similar problem appeared in the Eighth District, where the Montgomery County sheriff did not attend the canvass to report his county’s vote for John Culpepper, the Pinckney candidate for Elector. As a result, Jefferson also won this district. Jefferson Electors were certified in both districts. One other district was similarly affected by the failure of the sheriff to attend the canvass, but in that case two Jefferson candidates faced each other. The Glorious Burden, pp. 69-78. The Presidential Game, pp. 82-90. Marshall Smelser, The Democratic Republic: 1801-1815 (NYC: Harper Torchbooks, 1968), pp. 1-80. North Carolina Election Returns 1790-1866 (Stockport OH: 1992), p. 200.